Food & Wine’s “Best New Chefs” — Hello, Jason Stratton! It’s clearly Jason Stratton’s year. The 30-year-old chef took over the kitchen at Spinasse on Capitol Hill in April 2009 and he’s been flying high ever since. “I feel like I’ve won the lottery,” he told me last summer. “For what I’ve wanted to do, for what I’ve envisioned for myself, this is exactly what I want.” It didn’t take long for him to win another golden ticket. Today Food & Wine magazine named Stratton one of 10 “Best New Chefs” in America, a crowning glory that has him in New York City this week for a fete and a photo shoot. “I was completely shocked,” Stratton says of the phone call he received from Food & Wine editor-in-chief Dana Cowin a few weeks ago, when he learned of his win. “It was pretty awesome.” In June, he’ll attend the celebrity chef-studded Food & Wine Classic in Aspen, and his boyish face will join those of other up-and-comers on the cover of the glossy food-mag in July. Oh, boy! Jason Stratton, 30, the man behind Spinasse, gets a national spotlight. Since it’s inception in 1988, the Food & Wine honor has been bestowed upon some of the nation’s most talented and creative chefs, a prescient roll-call that has included high-profile chef-entrepreneurs Thomas Keller, Daniel Boulud, Nobu Matsuhisa and Tom Colicchio. 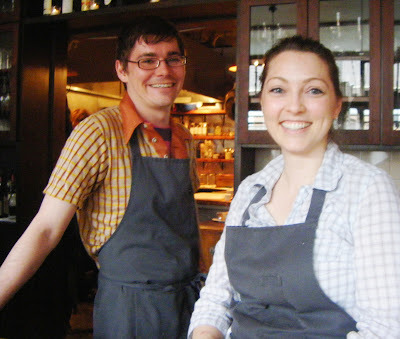 Locally and more recently the nod from Food & Wine has gone to Mark Fuller (2009), Ethan Stowell (2008), Matt Dillon (2007), Jason Wilson (2006) and Maria Hines (2005) whose restaurants make — and mark — Seattle as a go-to city for food fanatics in search of a thrill. Apparently, he’s had little trouble reaching the summit, changing things up at Spinasse and simultaneously grabbing the brass ring that leads to full national exposure. As if cover-boy status with Food & Wine isn’t enough in that regard, stay tuned for more: Stratton will soon be seen chasing around Seattle with his Spinasse sous-chef Carrie Mashaney at his side, challenging chefs Chris Cosentino and Aaron Sanchez in a food-focused scavenger hunt on the Food Network show “Chefs vs. City.” For more on that — and other happy news from Spinasse — stay tuned for my next post. Stratton, seen here at Spinasse, has reason to smile. As does his kitchen (and “Chefs vs. City”) cohort, sous-chef Carrie Mashaney.